If you want to hunt wild "Angel Stars," book your trip to the rain forests of South America. A more practical option is an order with Beautiful Orchids for this fantasy on floral form. In contrast to its spectacular shape, the petals and sepals of each bloom are clean, with minimal markings and an exquisitely curling lip, or labellum. The artful extravagance of the Angel Star Odontoglossum will be the grace note of any elegant interior. 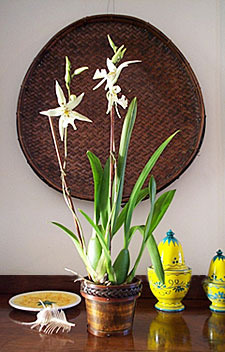 From base line to top petals, the orchid stands at approximately 18-25 inches tall. The blooms (6-8 buds) measure 5.6 inches in length. IMPORTANT NOTICE: The Angel Star Odontoglossum is currently available in very limited quantities, substitutions may at times be necessary. If a substitution is required you will be contacted. Plants are shipped in bud approximately 1 week before blooming. The buds will open gradually, growing more spectacular by the day for up to 5-6 weeks. This way, you get to enjoy the full blooming stage of this magnificent plant. Each purchase includes care instructions and an exquisite gift card for your personal message--only from Beautiful Orchids. Enjoy!